This holiday apartment situated on the first floor is ideal for families especially with children. The kitchen is open to the dining / living area. You can watch your children playing on the playground from the large terrace on the second floor. The Condado de Alhama is a top-class golf resort. With a total area of 90,00,000 square metres and an 18-hole golf course designed by world-class golfer Jack Nicklaus, it offers all sports enthusiasts a wide range of leisure activities, such as tennis, paddle, squash, soccer fields and more. 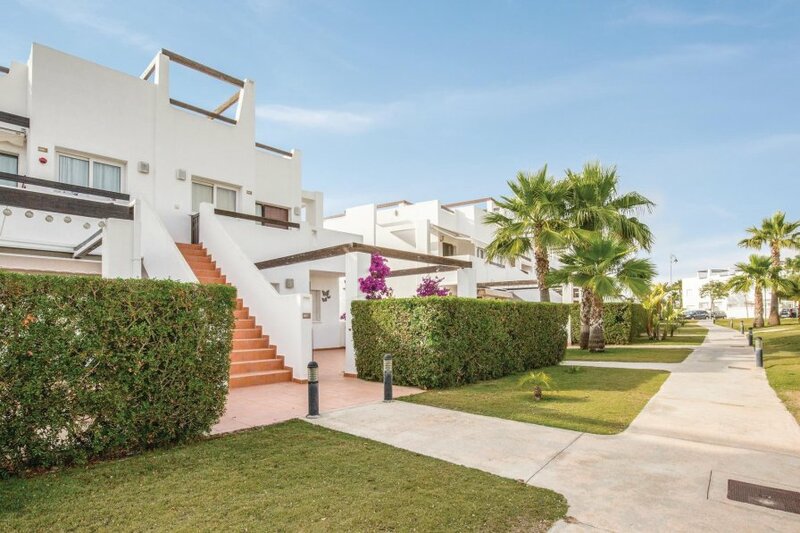 This is an ideal environment for families with children because of the beautiful gardens and numerous playgrounds around the golf course and also due to very less traffic within the secured facility. Visit Al Kasar shopping centre, a building with stunning architecture that offers bars, restaurants, supermarkets and golf shops. This solidly constructed modern apartment was recently built in 2008. The agent has rated it as a three star property so it is a well-kept apartment, equipped with standard furniture. It is also good value for money. This apartment has use of a shared pool and is located in Condado de Alhama, only 15km from Alhama de Murcia. It is set in a good location: there is a restaurant only 300 metres away. The apartment has free cable internet. You can also park on-site at no extra charge. The apartment is well equipped: it has a refrigerator, washing machine and dishwasher. It also has some garden furniture outside.